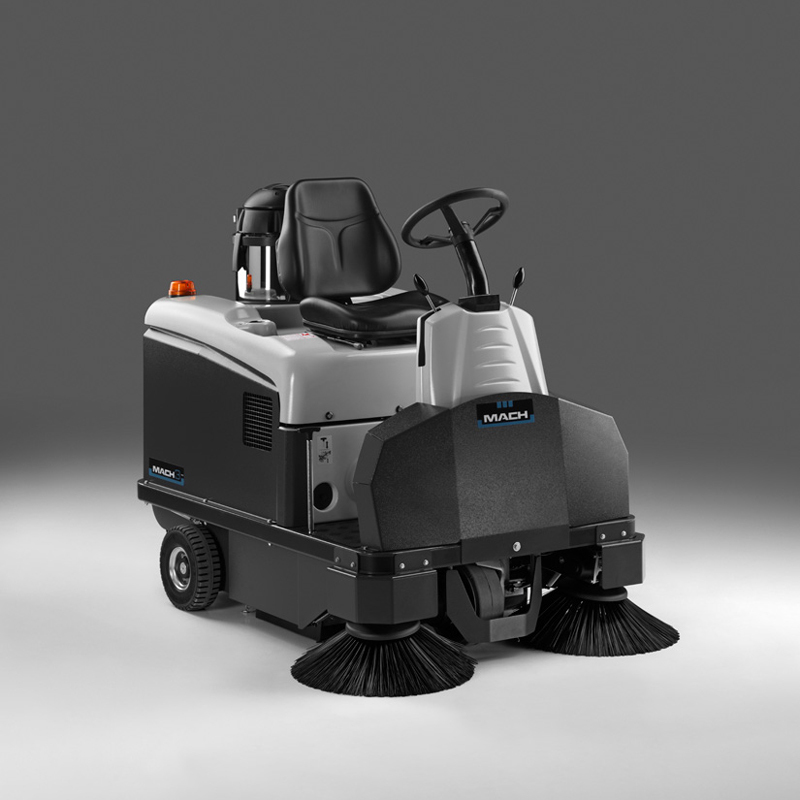 MACH’s top selling sweeper, robust, powerful and incredibly productive with a cleaning capacity of 10,140 m²/hour. 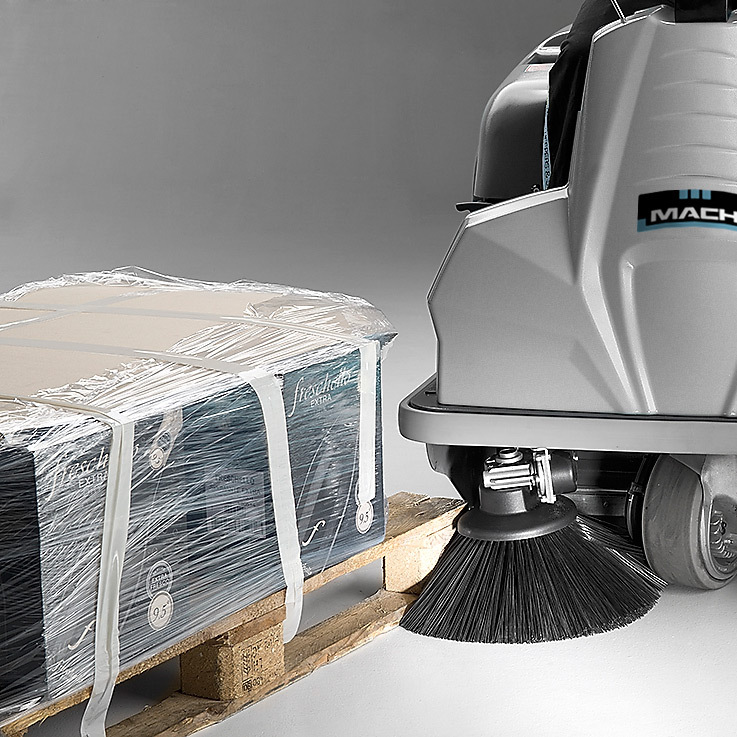 The MACH 3 PRO is packed with innovative technology that guarantees easy operation and maximum efficiency. Innovative sweeping for maximum productivity. Battery version perfect for both indoor and outdoor environments, with no emissions and silent operation. The powerful battery has a superior running time, maximizing productivity on a single charge. Honda engine with hydraulic front-wheel drive, increases maneuverability and power. Suitable for outdoor environments, versatile on all terrains. Incredibly efficient, maximum running time without the need to charge. 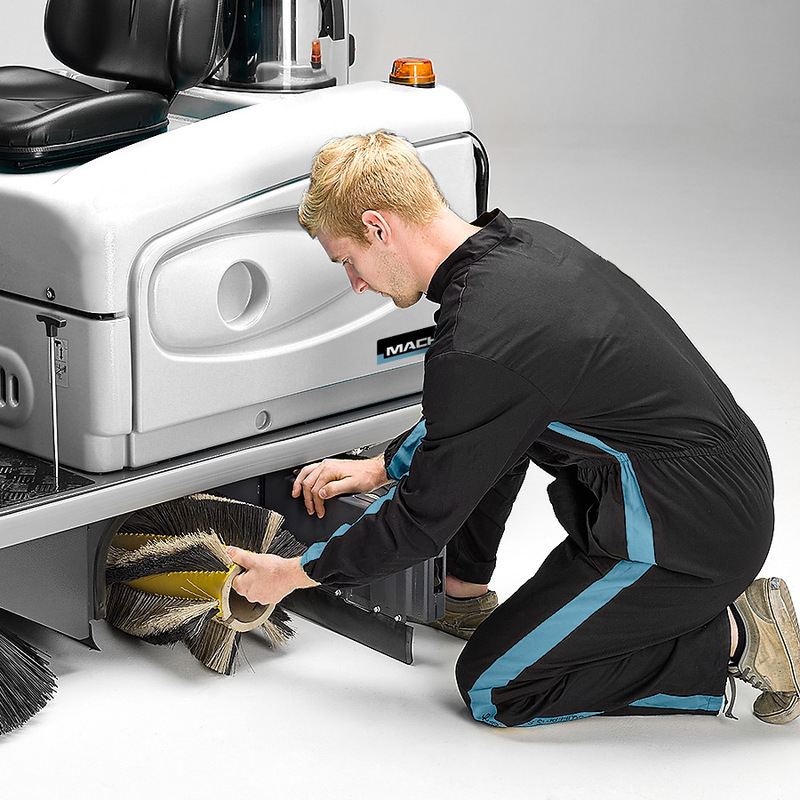 The MACH 3 PRO is the ultimate sweeper, combining quality, efficiency and speed to deliver an outstanding performance. 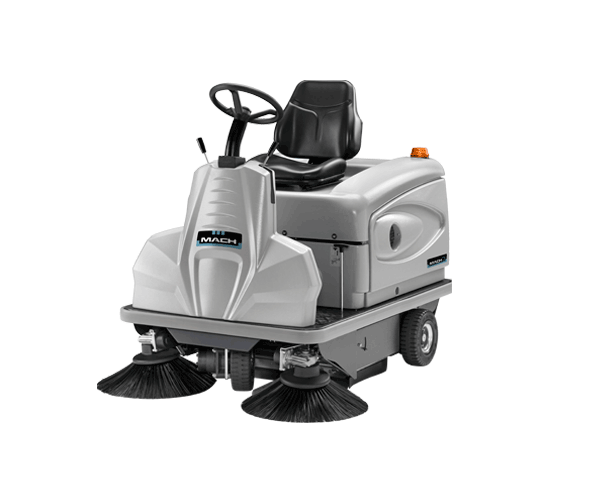 With a sweeping path of 120 cm / 47.2 in and top speed of 8,5 km/h / 5.3 mph, the cleaning capacity is an impressive 10.140 m² / 110,000 ft² per hour. 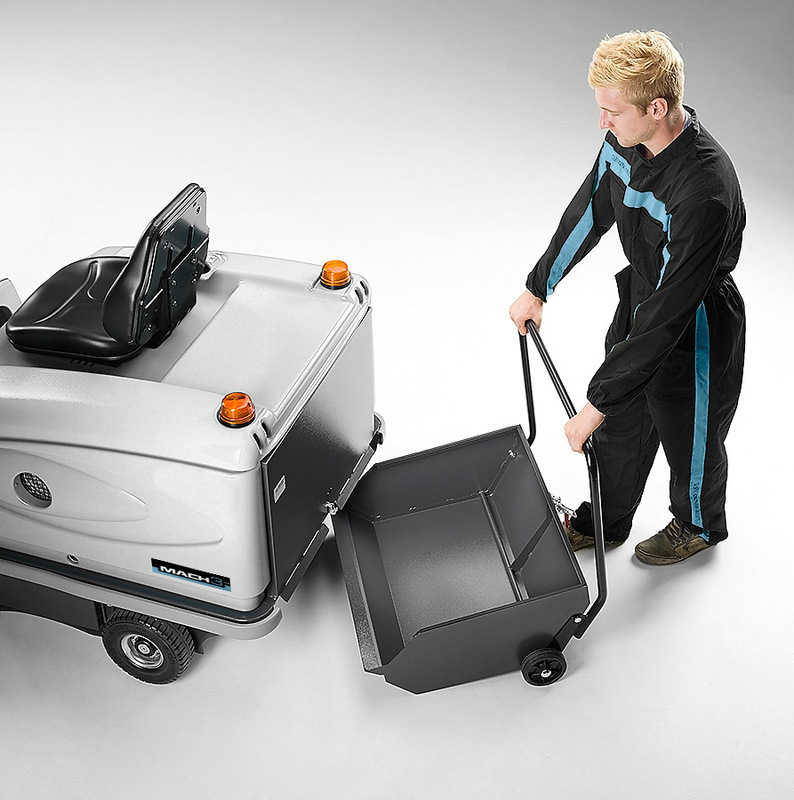 Its compact design enables the MACH 3 PRO to be highly maneuverable, with a turning radius of just 105 cm / 41 in, it’s perfect for narrow aisles and confined spaces inaccessible by a larger machine. 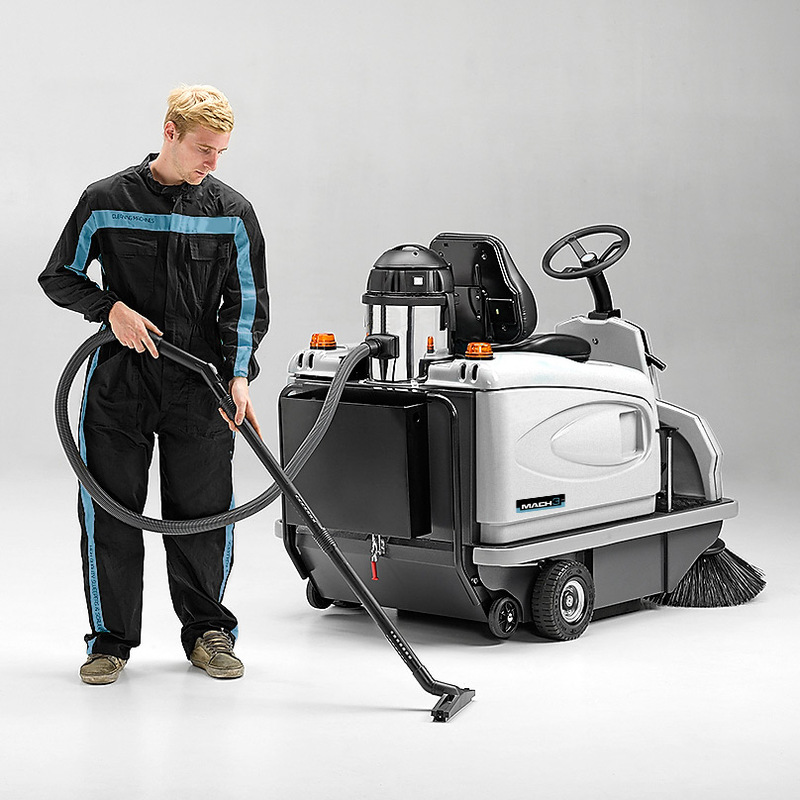 An on-board industrial vacuum cleaner also provides extended reach via a long wand. You can rely on our manufacturing process that uses top quality materials and components, ensuring reliability, durability and low maintenance. The MACH 3 PRO is heavy duty, built to withstand even the toughest environments. The Total Steel Line is also available. Our intelligent vacuum filtration system generates incredible cleaning power, delivering safe, dust free cleaning and optimum productivity. The filter is easily cleaned via an automatic shaking system, at the touch of a button the operator can completely clean the filter with being exposed to dust. The innovative polyester house filter captures 99.9% of dust particles. 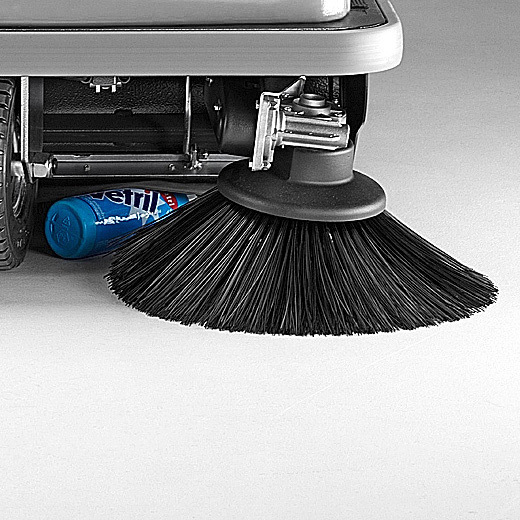 Safe and effective cleaning is easy with the automatic filter shaker. 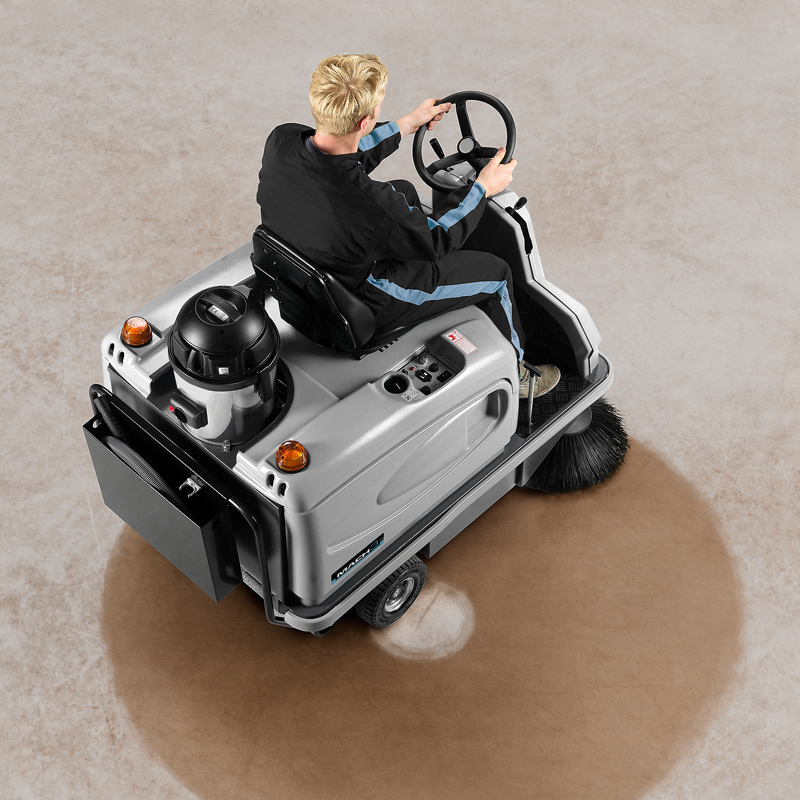 Its compact design means the MACH 3 PRO is highly maneuverable, a turning radius of 105 cm makes it perfect for confined spaces inaccessible by a larger machine. 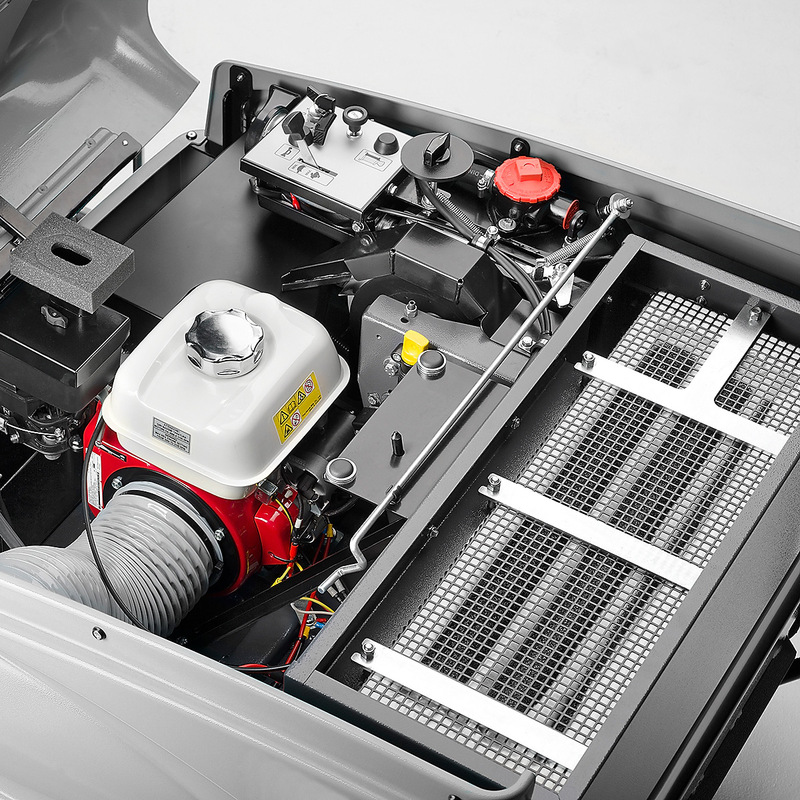 The optional, on-board industrial vacuum cleaner is independent to the sweeper, meaning it is more powerful than built in bypass vacuum systems. 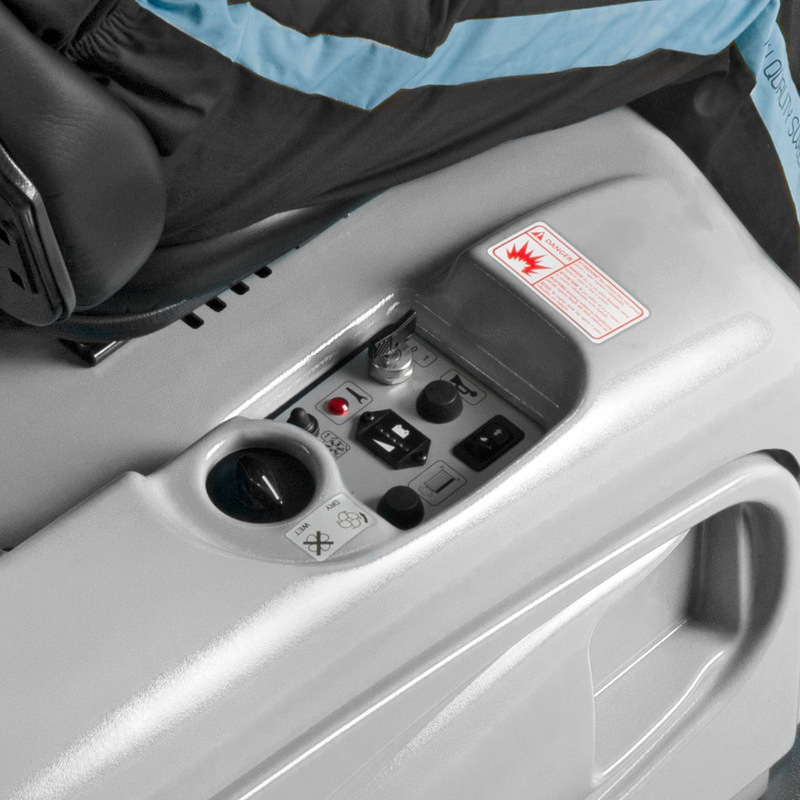 Controls are easy to identify on an ergonomic dashboard for maximum user comfort and easy management of sweeping power. Traction control via foot pedal is simple and responsive. The 85-litre hopper reduces downtime and increases productivity. Fitted with a convenient handle, wheels and removable baskets for easy transport and emptying. Activated from the control panel, the side brushes pass along edges and under low profile objects, effectively sweeping hard to reach spots. Designed to be highly resistant to wear and tear. The front flap allows pick-up of bulkier waste while the chevron main brush grabs dirt and drives it into the center, eliminating left behind side debris. The MultiBristle® main brush adjusts to uneven surfaces, ensuring consistent sweeping performance. The cover has an innovative locking system, providing quick access to the brush, which is easily changed without tools. The battery has a superior running time, for extra productivity. 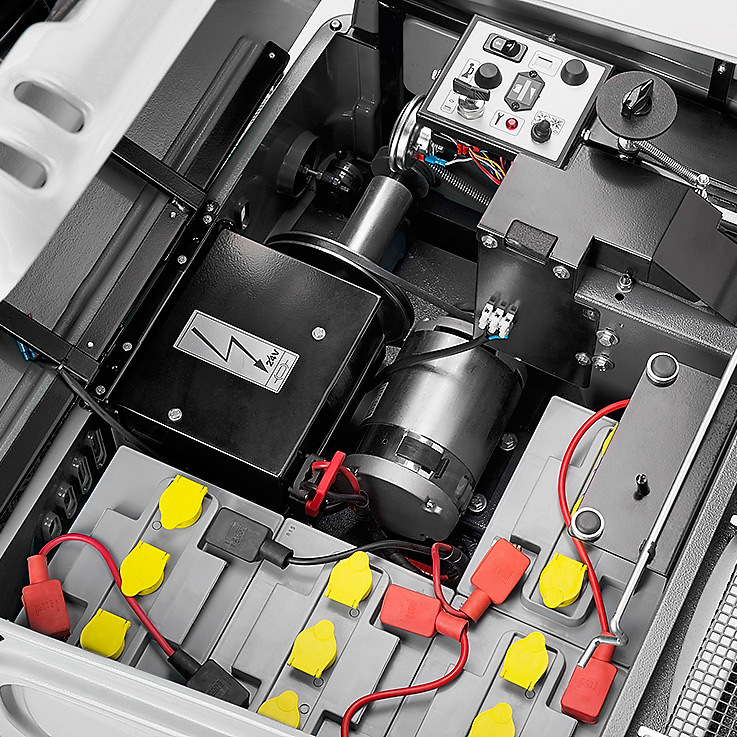 Maintenance is convenient and easy with full access to the battery compartment, motors and other service areas. Designed for tough environments, the Total Steel package provides a strong steel casing to protect the machine body and reinforcements which safeguard the side brushes. Indoors and outdoors, hard and soft (including low profile carpet). Key operated ignition, forward traction leaver, filtration system isolation, side brush control, handbrake, pressure sensitive safety seat, reverse beeper, horn, flashing lights.